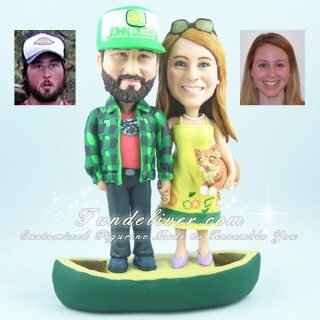 This is a completely customized canoe theme wedding cake topper order by one of our customers. 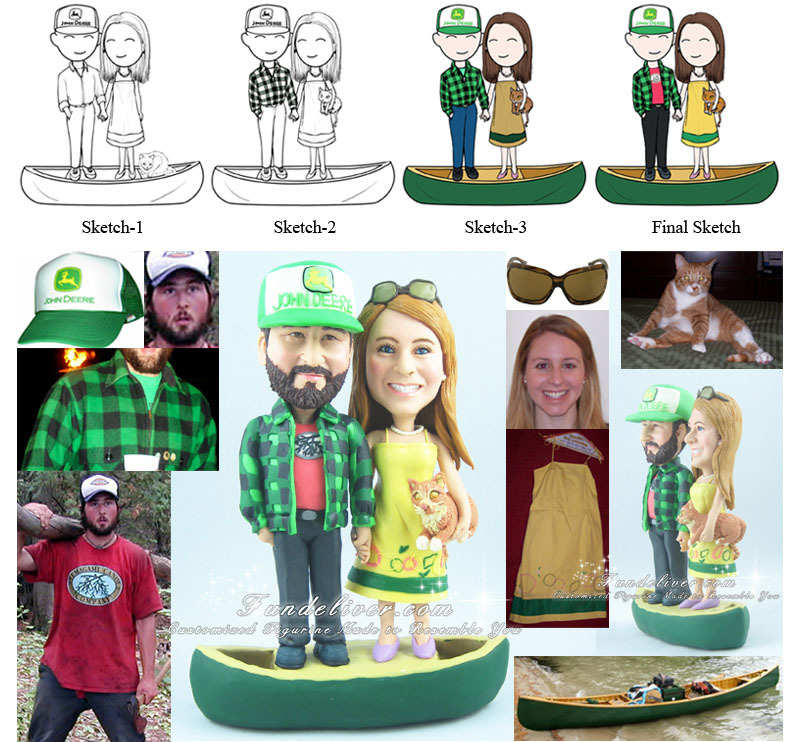 Groom: Garrett with beard, John Deere hat, green and black check wool shirt/jacket, button down shirt and blue Dickies pants. Bride: Amy with brown sunglasses on top of head, yellow dress, pearl necklace and earrings. Canoe: Green- see reference image. Cat: Bif, in Amy's arms. Garrett and I met at college. We were friends for 4 years, but didn't start dating until a week before graduation! We have been dating for ~7 years (in May), 4 of which were long distance from Michigan to DC then NJ to DC. This wedding has been a long time coming, but we are just as excited! As for the cat, Bif is my baby. I figured we each get something we really love (besides each other!) on the top of the cake. Bif is it for me. I've had him since he was a kitten and named him after a geologic formation the Banded Iron Formation (my other passion-I'm a geologist).